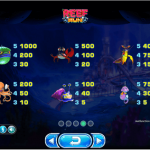 Reef Run, the latest video slot game from Yggdrasil takes us to an underwater city that includes an amusement park, a perfect place to be we must admit. The design of this game is spectacular with 3D symbols that come with an animation every time they take a part in a win. The sound effects are funky and they perfectly complement the game. There is only one special symbol in Reef Run, but it can indeed make some changes to your balance, and that is the big free spins symbol acting as a scatter. There is also only one special feature here, the free spins round. To activate the feature you need to land 3 scatter symbols to get 10 free spins, 4 scatters to get 20 free spins and 5 scatters to get 60 free spins. 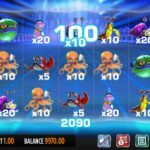 During the feature the sea animals can level up and increase the multiplier up to x20. 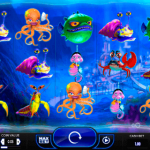 Another enhancement to the free spins round is the Reef Run. Namely you have to choose an animal and if that animal brings the most prizes at the end of the feature you will receive a mystery win of 400 and 25.000 coins. But there is a catch here; you need to activate the Golden Bet in the base game so you can play Reef Run during the free spins. Reef Run is a game that caught our attention with its beautiful design. It seems that all the games that come from Yggdrasil are designed with a special attention to details; probably that is why their games are becoming more and more popular. The game play is nice and smooth and there are a couple of features that can improve your balance in no time. This is the main reason we like this game and we believe you will like it to. For another great engaging slot you should consider playing Rainbow Ryan a 6 reel slot by Yggdrasil.